Filipino International Grandmaster Wesley So, now representing U.S. Chess Federation (USCF) since 28 October 2014, bulldozed his way to the top and became a clear 1st place winner with 8.0/9 points, a 1.5-pts ahead of the nearest followers, a foursome of 6.5 pointers (2nd-5th placers), at the 24th Annual American Open. The 24th Annual American Open was participated in by about 617 participants spread in 7-sections (Open, U2300, U2100, U1900, U1700, U1500 & U1250) has a total prize fund of $120,000 that took place at Bally’s Casino Resort, Las Vegas, Nevada. The main Open section was a 5-day schedule (December 26-30) with FIDE GM and IM norms available. 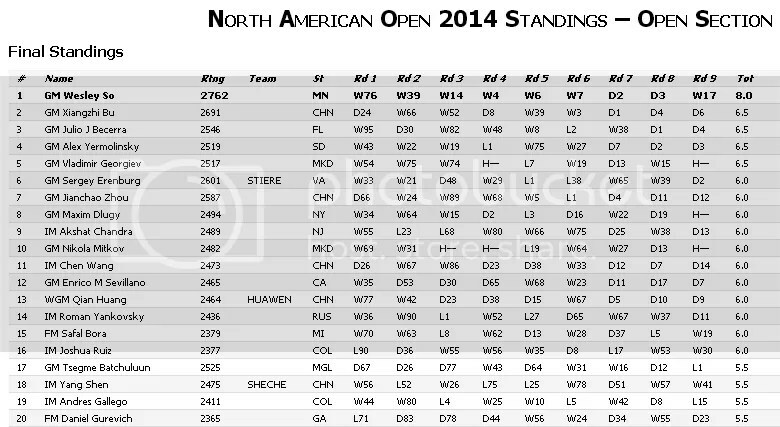 The Open section, with GM Wesley So (2762) as the Top seed had 95 entries (15-GMs, 15-IMs & other 65 titled/rated players). 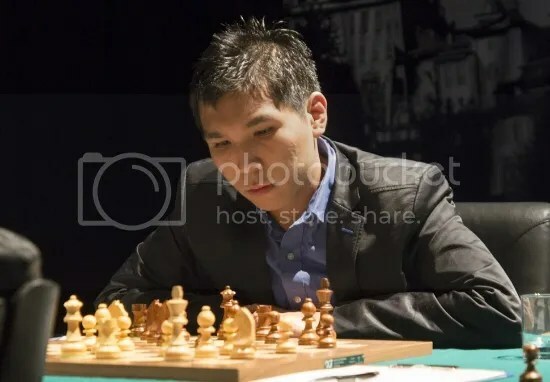 Wesley So practically demolished the oppositions by registering an impressive perfect score of 6.0-pts and a rating performance of 3263 after six rounds of play. It was only in R7 [GM Xiangzhi Bu CHN(2691)] and R8 [GM Julio J Becerra USA(2546)] where he drew back-to-back games. Fatigue taking its toll, what with a very hectic 2-games per day sessions. In the last round (after taking a good night rest as a result of a quick draw in R8) where he only need half point to assure him a clear 1st, he pressed on for a win in 46th move.against Mongolia’s champion GM Tsegmeg Batchuluun(2525). With this feat, Wesley had gained +8.7 that elevated his Live Rating to 2770.7 and maintained his rank as World’s #10 rated player though as of today’s Jan 2015 FIDE rating publication this results has not yet been included.. His final tournament performance rating (TPR) was 2855. He also took home the champion prize of $9713. 2nd to 5th place & prizes were shared in a four-way tie to GM Xiangzhi Bu (China), GM Julio J Becerra (USA), GM Alex Yermolinsky (USA) and GM Vladimir Georgiev (Macedonia) who all scored 6.5/9. Each one took home $2314 as prize. The next tournaments slated for GM Wesley So will be the Death Match 30: So-Nakamura come January 3, 2015 at 9am Pacific (noon Eastern) @ Chess.com/TV. Additionally, the 77th Tata Steel Chess Tournament on 9 – 25 January 2015 at Wijk aan Zee. Pls visit CALENDAR of EVENTS and Upcoming Events.